Here's a fascinating new Kickstarter project: an RPG that sets out to teach Japanese to English speakers. 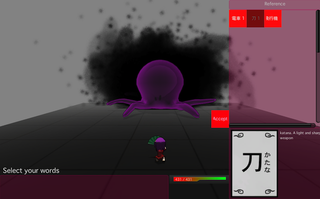 It's called Koe, and it's a "traditional" turn-based RPG designed to teach you how to read and understand Japanese. Sounds cool, no? Those of us who enjoy RPGs but don't speak Japanese have missed out on some solid games due to the impenetrable language barrier, and this seems like a fun way to learn at least the basics of Glorious Nipponese. Creator Jitesh Rawal wants £35,000 to commission new art, secure licenses, hire a composer, and do all the other money-consuming tasks that game development requires. You can check out the Kickstarter right here.